tidal resource worth talking of. solar farming (with mirrors, panels, or biomass). 5 W/m2 × 450 m2 = 54 kWh/d per person. the winter is also a concern! contribution of plants could be more than 12 kWh/d per person. power in other people’s deserts (as discussed on p179), or both. Figure 30.2. 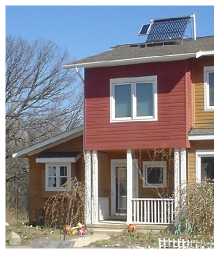 A solar water heater providing hot water for a family in Michigan. The system’s pump is powered by the small photovoltaic panel on the left.